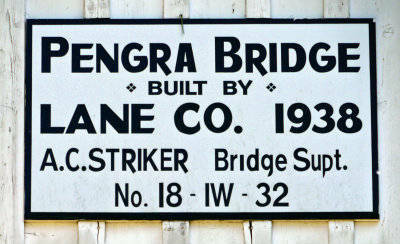 Pengra Covered Bridge was built in 1938 to carry travelers across Fall Creek to the nearby towns of Jasper and Lowell. The Pengra Bridge contains two of the longest timbers ever cut for a bridge in Oregon. The lower chords measuring 16" x 18" x 126 feet were too large to be run through a mill and had to be rough hewn in the woods. Booth-Kelley Lumber Company cut and transported the timbers to the bridge site by truck where they were resurfaced before being set into place. The bridge was named for B.J. Pengra, a pioneer who eventually became general Surveyor of Oregon in 1862. It's also known as the Fall Creek Bridge for the waterway that it spans. Pengra Covered Bridge is one of 20 covered bridges in Lane County and 50 covered bridges in Oregon. 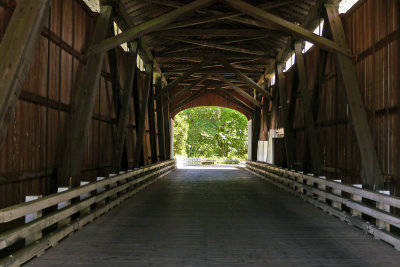 Lane County has more covered bridges in its borders than any other county west of the Mississippi. Seventeen of these bridges are listed in the National Register of Historic Places. 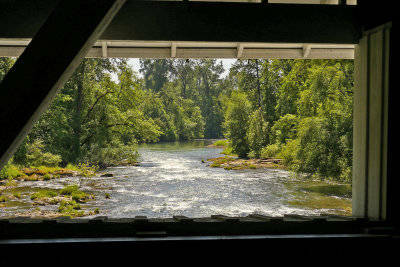 Six additional covered bridges are within easy driving distance from the Pengra Bridge, starting in Cottage Grove. Directions: Follow Jasper Road south of Springfield to Jasper and continue traveling southeast on Pengra Road 4 miles to Little Falls Creek Road. Turn east and travel 1/4 mile to Place Road. The bridge is located 100 yards south on Place Road. Is This The Best Campsite on the Oregon Coast? You're Safe From Zombies in Eugene, Oregon! Or Are You? An Idea For Fresh Localism Content - Where Was This Picture Taken?